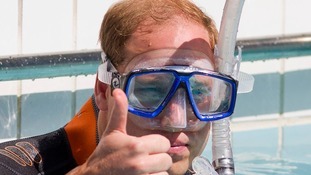 Prince William has joked that anyone who smashes a window during the upcoming football match at Buckingham Palace will have to answer to his grandmother. The famous landmark will host its first ever football match between two of England's oldest amateur clubs later today, as part of the Football Association's 150th anniversary celebrations. The Duke of Cambridge paid tribute to football's unsung heroes by honouring 150 grassroots volunteers ahead of an historic match in Buckingham Palace's garden today. Civil Service FC and Polytechnic FC, both based in Chiswick, will play a Southern Amateur League fixture in the gardens of the famous landmark - the first time a competitive match has been held at the Palace. At its best, football is a powerful force for good in society. It binds people from different backgrounds, communities, faiths and abilities - and gives them a common interest, a unifying identity. I believe over its 150 years, football has remained a wonderful example of the power of community and of our ability to come together to organise and to enjoy a simple pastime. One warning, though: if anyone breaks a window, you can answer to her. As the president of the FA, William has helped organise the match as part of the Football Association's 150th anniversary celebrations. The Football Association is preparing to honour over 150 grassroots volunteers in recognition of their dedication to the sport at a special event at Buckingham Palace today. The event, organised as part of the Football Association's 150th anniversary celebrations, is being hosted by the Duke of Cambridge while former players including Michael Owen will also attend. The recipients were chosen for their outstanding contribution to football, including helping to develop the women's game, providing opportunities for disabled players and refereeing. 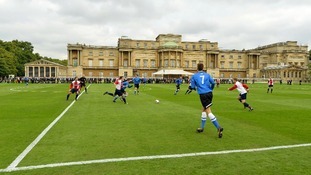 Buckingham Palace will also host its first ever football match today between two of England's oldest amateur clubs as part of the celebrations. The Evening Standard's 'Power 1000' is drawn from all sectors and walks of London life - from finance, to theatre, technology, media and politics - the list is selected by a panel of London Evening Standard reporters and critics. London is a magnet for the rest of world and our newest power resident, Prince George, is a timely symbol. He is our greatest tourist attraction, along with his great grandmother, which is why he has been chosen this year as the first among Londoners.